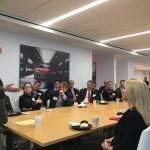 The ACG holds regular events in Washington, DC, in an effort to keep Young Leader alumni and ACG members in the region engaged in transatlantic dialogue. Leading up the U.S. Presidential election, Handelsblatt established an “Election Camp” in Washington, DC, and hosted a series of policy discussions. On November 1, 2016, the ACG partnered with Handelsblatt to hold a discussion with former ACG Board Member Ambassador Robert Zoellick, former President of the World Bank and 13th U.S. Trade Representative. He noted the polarization of the United States on trade agreements and gave a passionate defense of globalization. On May 23, the ACG partnered with the German Marshall Fund of the United States, AICGS, the Transatlantic Academy, the BMW Center for German and European Studies, and the Transatlantic Center to hold a panel discussion on the life and legacy of former Foreign Minster Hans-Dietrich Genscher. ACG Chairman Ambassador Robert M. Kimmitt and Ambassador Wolfgang Ischinger (1978 Young Leader), Chairman of the Munich Security Conference, together with moderator Dr. Hope M. Harrison (2003 Young Leader), Associate Professor of History and International Affairs at George Washington University’s Elliott School of International Affairs, discussed the critical role Minister Genscher played in the unification of Germany in 1989 and 1990. Both Ambassador Ischinger and Ambassador Kimmitt spoke of the high level of trust that Genscher was able to build with each of the people involved in the Two-Plus-Four agreement. Ambassador Ischinger said that “Trust is the currency of diplomacy,” and that Genscher went to great lengths to establish the trust that was quintessential to reach the final agreement. On May 18, the German Federal Minister of the Interior, Thomas de Maiziere (1989 Young Leader), made a point of meeting with a group of nearly 80 Young Leader alumni and other special guests to discuss immigration, terrorism, and counterterrorism in the Capitol in Washington, DC. He was introduced by 2009 Young Leader Congressman Joaquin Castro (Texas-D). In his remarks, Minister de Maiziere said Europe and especially Germany are facing significant humanitarian and security policy challenges. Homing in on Europe’s refugee crisis, he said the migration of people is nothing new, but the volume of migrants and the speed and reason for their movement makes the challenge of managing migration that much more complex. He cited the threat posed by ISIL as a catalyst for the waves of migration. He said that no single country can tackle the challenges of migration or terrorism alone. On January 12, 2016, the ACG partnered with a number of other German-American organizations to host a panel discussion celebrating the life and legacy of Helmut Schmidt in Washington, DC. The panel included ACG Board member Dr. Henry A. Kissinger and two of Chancellor Schmidt’s former colleagues at Die Zeit, Dr. Theo Sommer and Dr. Constanze Stelzenmueller. They shared personal insights and offered their views on his legacy. The event may be viewed here.